Baba what? Baba ganouj (gan-oosh) is a delicious Middle Eastern appetizer made of roasted eggplant, tahini, and lemon juice. 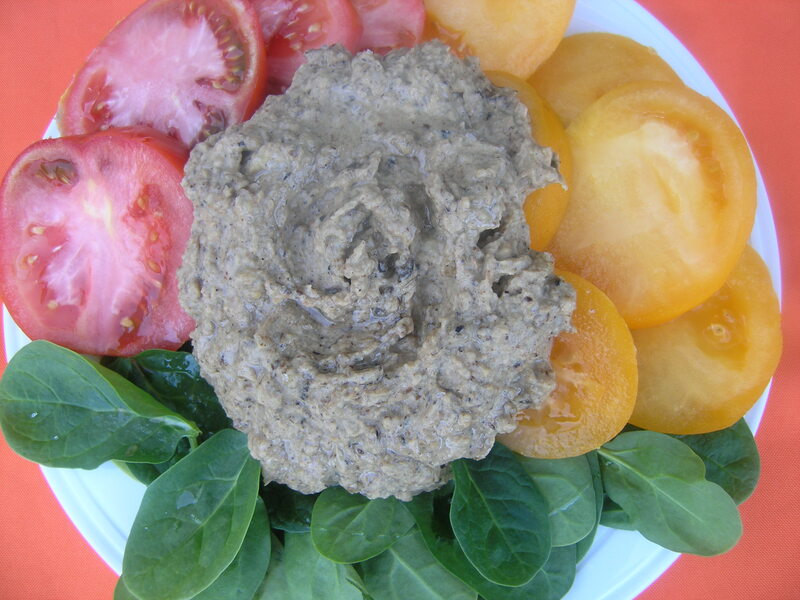 It’s similar to hummus, but the pungent roasted eggplant gives it a really special taste. I love it. It’s also a nice alternative to hummus because it’s lower in calories, carbohydrates, and fat. If you are watching your calories, this spread (made yourself of course!) is the better choice. I love the taste of baba ganouj, but I fell in love with it in a new way when we ate at Pita Jungle in Scottsdale, Arizona. The taste was smokey which I’d never tasted before. I immediately decided to try making this traditional recipe a little differently, grilling and roasting the eggplant instead of just roasting it. The results were delish. Even Ryan’s rather Southern teammate, who probably thinks Middle Eastern food comes from somewhere in Pennsylvania, loved it. Serve it as an appetizer, spread for sandwiches, or even as a side dish with falafel or grilled chicken. Makes: 2 1/2 cups or so, depending on your eggplant. Preheat the oven to 400 degrees. Also preheat your grill, or grill pan to high. Cut the eggplant in half, leaving the skin on, and lightly spray with cooking spray. When the grill or grill pan is hot, sear the inside of the eggplant, turning once after 3-4 minutes, so that it has nice char marks. Transfer the eggplant to a cookie sheet and roast in the oven for another 25-30 minutes, or until the inside of the eggplant becomes soft. Remove from the oven and let the eggplant cool enough so that you can pick it up with your hands. Use a spoon to scrape the eggplant out of it’s skin and put it into a food processor. Pulse the eggplant, garlic, and lemon juice/zest until it starts to combine. Add the tahini and pulse until the eggplant is thick but smooth. Drizzle in the olive oil as necessary with the food processor running until the eggplant is creamy. You may not need all of it, and can save some calories if you don’t use it, depending on how much moisture the eggplant retained during baking. Remove from the food processor and season with salt and pepper. Serve in a serving dish with pita chips and chopped vegetables or as a side to other Middle Eastern dishes.